Hip-hop isn’t just music. It’s community. 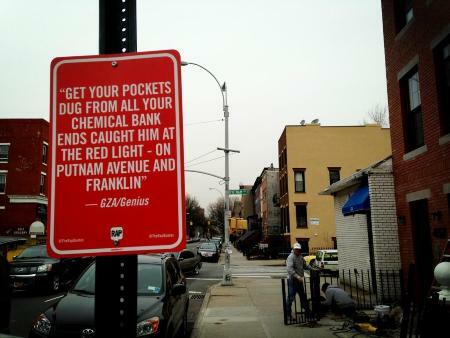 Jay Shell’s “Rap Quotes” project is great on so many levels. 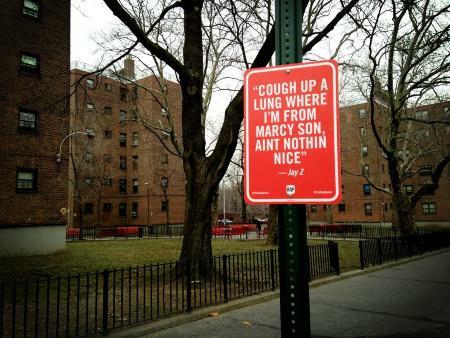 It’s an art installation popping up over an entire city, a quest to install rap lyrics across each neighborhood of the Big Apple. 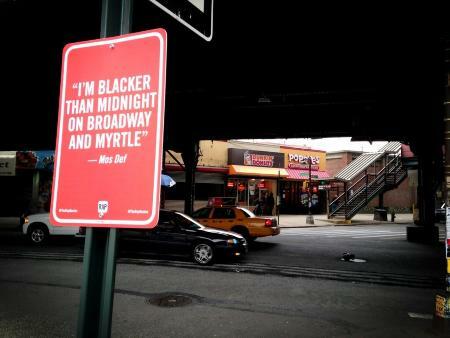 Basically, Jay attaches official-looking signs as an homage to lyrics that correlate with a spot. To me, the best part is that it’s a participatory event. The artist interacts with the local environment, while the community gets a chance to talk, tag or tear down each quote. Continuous loop of discussion, centered around hip-hop and the community. I guess that’s what’s beautiful about hip-hop in general: it always about the community. Below, a few snaps of the quotes and a video of Jay installing them. You can support the project by purchasing a t-shirt on Jay’s website.